This diagram is a variant on a slide I have used in numerous presentations over the last few years and interestingly I think it’s still as relevant in the current “web 2.0 meme” discourse, although I might have a go at extending it to explore more explicitly some of the pros and cons specifically relevant to social networking… informality, privacy, openness are words that immediately spring to mind. The pros and cons of technology Below is a transcript of the text that normally goes along with this slide.. What’s fascinating about technology is the way in which whatever aspect of it you look at there are pros and cons… So yes the internet now means we have access to vast quantities of materials, but there are increasingly real issues about information overload and issues about assess, and about assuring the quality and authenticity of materials. The wealth of new tools for communication offer opportunities for new forms of dialogue and collaboration but bring with them associated issues of a need for new forms of literacy skills. The internet provides the potential for new forms of community, but often learners are confused and feel isolated in these virtual environments. Some students relish the opportunity to communicate online, others don’t and prefer face to face interaction, lurking in online discussion forums. Also communication is different online, a slight joke in a face to face setting can be viewed very differently online, causing offense. The internet offers us instant access to information. Which means events unfold immediately as they happen. However this can result in a rather surface approach to what is happening as the Iraq war or September the 11th demonstrated, we watched the events unfold online but somehow they did not seem real – it’s like watching a movie. Finally there are the potential for new forms of virtual representation, such as medical simulations, virtual worlds and the ability to adopt personal avatars. However this can result in a feeling of a lack of reality not knowing what is real and what is fake. I recently felt this very strongly when I was being shown around the Nursing school’s Virtual Interactive Practice suite [This was at Southampton University in ca. 2005] which is a mock hospital ward with interactive computer dummies where you can simulate heart attacks, etc. I was for a moment confused by which were the dummies and who were the students! Would welcome people’s thoughts and comments on this!! OOhhh I think this week’s bone of contention may well be around the limitations of email. Patrick is the latest to blog on this. I got in the same mess as Patrick this morning composing an email, then loosing it because I was over my limit aaaarggghh (I suspect the culprit was the same massive document Patrick referred to!!!). Alan adds some interesting thoughts on the subject raising the question ‘is there something in the air?’ Dunno Alan guess we’ll have to wait and see! Just came across the following presentation from Stuart Lee which outlines some of the potential negatives about Web 2.0. Your mailbox is over its size limit! So why is one of the most frequent emails I get the one from my friendly ‘System Administrator’ with a big red exclamation mark ‘Your mailbox is over its size limit’. Here is one of these emails lovingly captured for prosperity. So why the limit? Where’s the justification? Isn’t this a case of the tail wagging the dog?? Barnes, C. and Tynan, B. (2007), The adventures of Miranda in the brave new world: learning in a Web 2.0 millennium, AL-J 15(3). …from the experts. 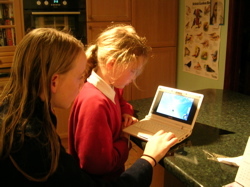 Pic just taken of my two playing with the new Asus MiniBook. It’s one thing talking about how these things might be used by kids in an esoteric ‘acedemic meeting’ but it’s just not the same as seeing the thing in action with the real users. Reaction from my kids? Let’s ask ‘So what do you think of it girls?’ ‘Good’ ‘No wait wait come back Tabby, I’m just about to die…. NOOOOooo fell into some trees! ….. crisis over the trees have left us….’ OK you get the picture, they were straight in there, onto the games, totally engaged… The trick is how will kids engage with tools like this for learning, for exploring learning across formal and informal boundaries, for encouraging them to take control of their learning, to adopt an inquiry-based learning approach??? These are some of the questions we are exploring in an exciting new project called PI (Personal Inquiry) under the ESRC/EPSRC TEL programme, led by Mike Sharples at Nottingham and Eileen Scanlon at the OU. 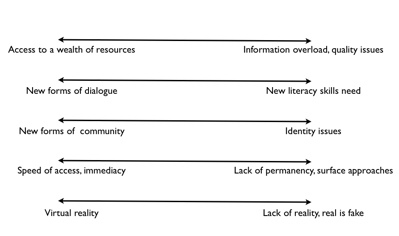 Both Lorcan Dempsey’s ‘Webified terminologies’ and Martin Weller’s ‘A lexico for the virtual/real world intersection’ nicely illustrate the ways in which we as a community are struggling to make sense of it all. 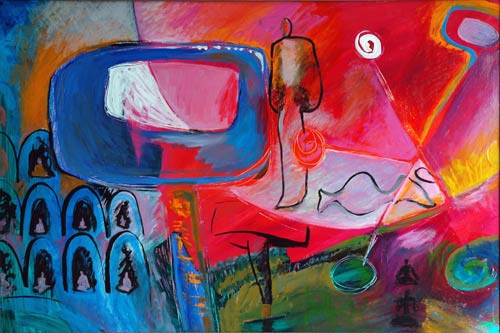 I’ve posted on aspects of this before ‘New forms of sensemaking’ and ‘Degrees of meaning’. New tools and services are emerging all the time, offering new possibilities for changing how we do things. This used to be primarily about making what we did already easier, quicker – now it’s arguable that these things are actually changing the way we do things. In turn use of new services generates ideas for further tools and services. So I do think that we are now seeing a real co-evolution of how we do things and the tools we use to do it. But how do we describe this? There are two levels to this – the words we use – hence Martin’s wiki challenge for terms (such as twintle and unpoke) and then metaphors which attempt to encapsulate the new forms of interaction with technologies and the associated changing behavioural patterns. In the early days of the Internet space as a metaphor worked pretty well – ‘Virtual Universities’ with virtual lecture and seminar rooms, social virtual cafes. 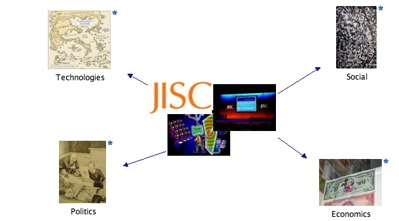 More recently time analogies have become more prevalent – the chronological nature of blogs, the streaming twitter chat in the background. But increasingly I feel these simple metaphors don’t really describe what’s happening; are we at the cusp of radical changes in the way we do things, where the boundaries of the physical and virtual really are blurring, where that co-evolution of user and tool is pointing to something totally new. Gosh now I’m struggling to make sense of it all!!! Straight after reading HeyJude’s ‘the whole audio thing’ about vozme I couldn’t resist trying it myself. True enough in two ticks I had an alarming sounding audio of some of my text!!! Try it yourself! On the one hand great this is so simple, on the other hand, as usual we as teachers need to think carefully when and why such a facility might be useful as opposed to presenting the information in straightforward textual format. As more and more different possible ways of representing things come on stream and the tools for rendering them in different formats becoming easier to use. It seems to me it is more important than ever that we find some way of helping teachers and students to make judgements about the pros and cons of each and about appropriate mixes to meet particular needs. Brian Kelly is having a ‘Groundhog day’ moment with the announcement that institutions can now have a presence on facebook. It’s just like 1993 and 1994 all over again. Have we learnt from our experiences when we first set up our first organisational Web sites, health or are we doomed to repeat the mistakes - and perhaps, order as a indication of progress, discover new mistakes that we can make? The powers that be in the institution began to get wind of this ‘Internet’ thing; suddenly it began to appear on senior management’s agenda. One of the deans apparently was particularly concerned that ‘some academics even had pictures of their cats on their web sites!’ – guess who? And this time, unlike the early 1990s, will it be the marketing people who are keen to establish a presence in this popular social networking service with the techies warning about the dangers of data lockin and lack of interoperability? Of course the debate about VLEs/LMS vs. PLEs and beyond has been raging for years, malady but with the increasing impact of Web 2.0 technologies and the shift towards more open philosophies (Open Source, buy Open Content, mind etc.) and associated high impact applications of these (facebook apps, now OpenSocial) it seems to have gained momentum as is evident by a spike in the discussion I noticed this week. Now we all now this isn’t a simple question of right or wrong – the arguments are complicated. But to pick up the gist of some of the recent arguments for and against (or perhaps it might be more appropriate to say round and about!!) have a look at a couple of the postings yesterday - Martin Weller’s ‘The VLE/LMS is dead’ referring to Scott Leslies ‘Loosely couple teaching’ “versus” Niall Sclater’s ‘The VLE is dead, long live the VLE’. I seem to have been in quite a few events recently focusing on horizon scanning and in particular mapping societal and educational changes to trends in technological developments. I think this demonstrates that the educational sector as a whole is really reflecting on the ways in which technology might have a significant impact on ALL aspects of the business - to the extent that the very way we structure, organise and support learning might change.